This may or may not be new to you but withdrawals using other banks’ cards, sending or depositing money to accounts of other banks, etc, usually incur a transaction fee*. 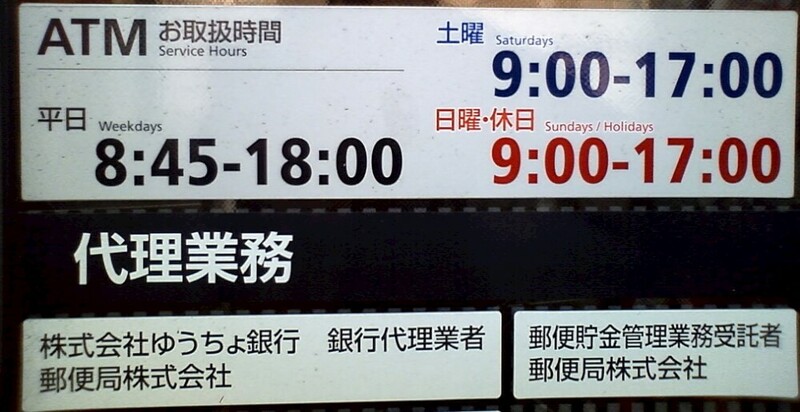 For example, a typical transaction fee is 108 yen during normal hours and 216 yen during off-peak hours and weekends. When the amount of money sent balloons over certain limits (such as 100,000 yen), the fee can increase to around 432 yen. A point to note is that the fee for transferring money across different banks is not unique to the ATM. In fact, it often costs double to do so over the counter. *note that these fees vary from banks to banks and some do offer free services. The operating hours and cost of using a Seven Bank ATM with a Japan Post Bank card. お引き出し= withdrawal, お預入れ = deposit, 残高照会 = account balance, 無料 = free, 取扱なし= unavailable, 月曜 = Monday, 土曜 = Saturday and 日曜 = Sunday. Most ATMs in Japan do not operate for several hours each day. Most also have shorter ‘working hours’ during weekend cos they need to spend time with their mini-ATMs (as you may have already realised from the first image). The irony is that more often than not, the time of day that you need money most urgently (for a late night cab, for example) is the time that the ATMs are least likely to be operating. While Seven Bank ATMs, in principle, run 24 hours a day, it really depends on which banks’ card you use. Using a Japan Post Bank card on a Seven Bank ATM would see a short 10 minutes break each night from 23:55 to 00:05. Surprise surprise. When I first tried to send money to a third-party bank account via a Japan Post Bank ATM, I didn’t find an option to do so. I was using the English menu because it was a huge sum of money I was dealing with and I didn’t want any surprises which may have occurred if I were to read the instructions in Japanese. That led me to believe that Japan Post Bank only allows for transfers within the same bank. It was only after some time that I realised my mistake. I was chatting with a Japan Post Bank employee over the counter, complaining about the trouble with having to send money over the counter all the time, when he started giving me blank looks. He brought me to the ATM machine, and after fumbling around for a while, we both learnt that not all the options available in the Japanese menu are available in the English version. It seems that ATM user interface designers were not expecting anyone to send money in a foreign language. Thankfully, many other ATMs have a dual language function (both languages on display at the same time). Accepting coins is one thing, accepting coins that no other machines accept (1 yen and 5 yen) is another thing altogether! I often hear people lamenting about the mountains of 1 yen coins they have at home and wonder if they are aware of the ATM’s prowess. While it only takes 100 coins per round of deposit, that is still far more efficient than trying to use up your 1 yen coins at the nearby convenience store. For those with no inkling of the Sino-Japanese counting system or kanji characters, this might come as a surprise. While the 100 (百) and 1,000 (千) counters are available, larger sums of money are counted in tens of thousands (万). Yen itself is denoted by 円 (refer to the photo below). While you can always opt for pressing multiple zeros instead of the 千 or the 万 button, you need to distinguish them from the 円 button, since the 円 button has to be pressed to signify you have finished entering the amount of yen to withdraw. Saving on Taxi Fares in Tokyo Tokyo Then and Now: Photos from Past Centuries The “Thousand Yen View” in Fuji Five Lakes Area Snapshot: Mochitsuki (mochi-making) Festival Toranomon Hills Opening Soon!